Ms. Bhandarkar has obtained her graduate degree in science from the Mohanlal Sukhadia University, Udaipur and completed a two year post-graduate programme in management from the Indian Institute of Management, Ahmedabad. Ms. Bhandarkar has over 25 years of experience in the financial services industry. Prior to joining our Company, she held the position of the Managing Director and Vice-Chairman, India, of Credit Suisse Securities (India) Private Limited (“Credit Suisse”). Ms. Bhandarkar​ has served as the head of Indian investment banking and global markets solution group, India, at Credit Suisse from July 2010 to February 2015. 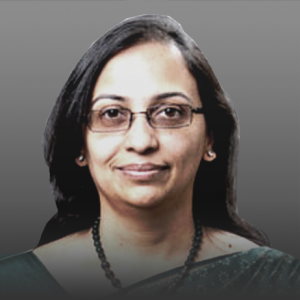 She has also worked with JP Morgan India Private Limited in India as the Managing Director from May 1998 to July 2010​.